This couple from El Dorado, Arkansas both occupational therapists, picked the West Bay public beach for their wedding last week. Staying at Morritts Tortuga, they came down to the northern end of Seven Mile Beach for their evening wedding. 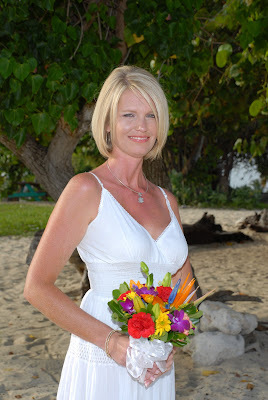 Beautiful bride, beautiful bouquet... a tropical posy from Trisha's Roses. School's out and a lot of the town's children enjoy this spot, jumping off the pier into the water. It was nevertheless easy to enjoy some privacy. The children are always excited to see a wedding, but well-mannered enough to stay out of the pictures. In the background, across the water is our capital city, George Town. Another pier-shot, early enough to get some of turquoise water.